“PEARL HARBOR” By Randall Wallace. (Fiction) It was the end of innocence and the dawn of America’s greatest glory. World War II was brought to America with the attack on December 7, 1941. 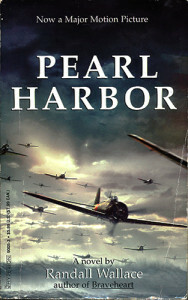 Written by the author of “Braveheart” this is the novel that became the major motion picture “Pearl Harbor.” Based on the facts of the Japanese attack on Pearl in 1941, Wallace brilliantly adds the fictional pilots, Rafe McCawley and Danny Walker to bring a life-like story to this dark time in American history. 2001 first edition Paperback. 309 pages, no photos or index.